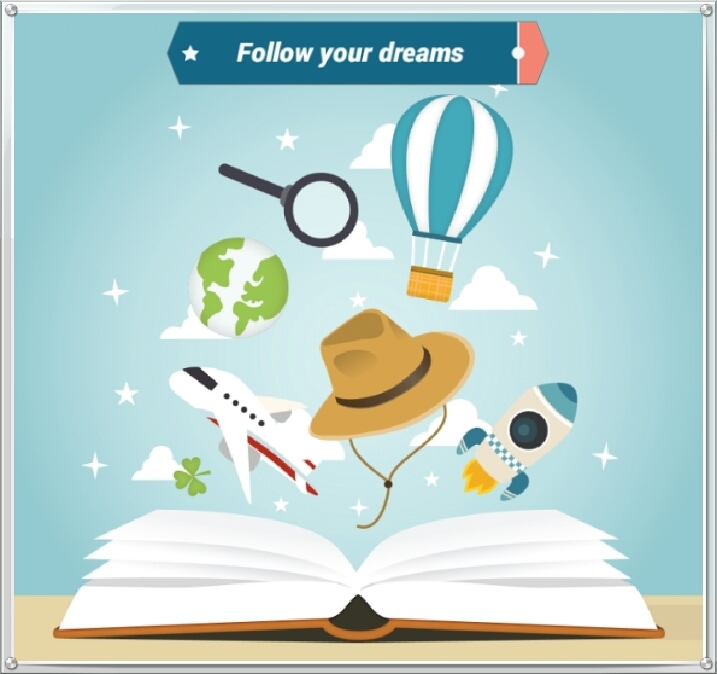 Chimmyville > Finance > Should you follow your dreams? Recently I shared my wish/life list with some members of my family which was mostly met with laughter and comments of me needing to win the lottery, but it left me thinking – should you follow your dreams? Most of us are told at a young age to always follow our dreams but as we get older and things like bills and other responsibilities start to occur it seems to be more difficult to realise your dreams. Also dreams change. I know when I was younger I wanted to be a brain surgeon, I also thought my gran got a ride to school from a brontosaurus and wanted one as a pet lol – I was 5. When I was with my ex he had a bunch of self help books to help you realise or accomplish your dreams, but no matter what the experts may tell you, it’s not always that easy to make money from some passions. For example you might love food and you might score a job as a food critic but unless you also like writing it’s not going to work out too well. You might have some interests and strengths that are relatively easy to turn into a career, for example dress making, graphic design etc. Often, these sorts of interests lend themselves to self-employment, I had a friend that went to two universities doing an art degree and is now a self employed seamstress and loves her job. Some people love to work for themselves; others find it very difficult to be happy without a steady paycheck and colleagues. 12 hours a day and not getting home until 11pm but it is his passion. His dream is having his own kitchen. There’s nothing wrong with a steady pay check, there’s nothing wrong with self employment and there’s certainly nothing wrong in using that steady pay check to help you realise your dreams. For example, one of the dreams on my list is to meet Alyson Hannigan (Denisof) who plays Willow in Buffy the Vampire Slayer, Michelle in American Pie etc. That dream will become true at the Buffy convention ‘Prophecy’ this year which wouldn’t have been possible without my steady pay check and knowing how much I can save for it. Would you rather have more freedom or more money? How motivated are you to follow your dreams? Do you like to switch off from work at the weekends? I know a lot of what I’ve touched on in this post is work or income related but realistically most things will cost money to achieve. Would you rather have a dream job or career or the steady pay check enabling you to accomplish other things on your list? I think there are no right or wrong answers. If you want to pursue a dream carer – great! If you want to give up work altogether and go travelling – also great! If you’re happy with your “9 – 5” and use the money to accomplish dreams you couldn’t have done without a steady pay check – that’s great too. For me? It’s not about the steady pay check, although that’s nice to accomplish some of the dreams on my list, it’s about enjoying the work that I do. Being challenged. Enjoying my social time. Image credit: Designed by Freepik and modified by me. This is so relatable right now, and definitely something a lot of people struggle with. You’re right, as kids, if we’re lucky we’re told to follow our dreams but it’s difficult once you get older. The message changes a bit, doesn’t it? It’s more like you need to find a steady job and settle down….! My advice would always be to find what makes you happy, and build your life around that. Just do the things you like and usually that helps with those bucket lists. I don’t care for them, because you won’t really be enjoying them or life in the process. To be honest, personally I hate bucket lists or ‘101 in 1001’ lists. When I was younger I really wanted to set out and do a lot of things, but because of my living arrangements, lack of money, transportation, etc. I felt that I was deliberately choosing things for my list that I would be able to achieve. Instead, I keep a mental bucket list of places I want to go and things I want to do. I can remember because there aren’t many, and it keeps things somewhat spontaneous. Despite this, I don’t think my dreams are necessarily associated with what I want to do. I have done a presentation on how I followed my dream and did what I love – and that’s how I landed a job doing what I love. I pursued many other interests until I found something that would work for me. But as you said, everyone is different. I think what matters is that you are happy, above all.